You have a coop full of chickens and you’re wondering if it’s time to set out on the adventure of selling farm fresh eggs. Let’s take a look at some of the pros and cons that come along with the decision to sell chicken eggs from your homestead. If you work things correctly, deciding to sell chicken eggs from your homestead can help cover the cost of your own eggs—essentially creating a situation where the eggs you personally use are free. In some locations, selling chicken eggs may bring you extra money above and beyond your cost. Kids learn that money can be earned from work, and they see the process of caring for the chickens, collecting the eggs, and selling those to earn a little money. These real life skills can be honed early when you let your kids help sell chicken eggs. If your kids are old enough, you can even “put them in charge” of your homestead’s egg business. When you decide to sell chicken eggs, it’s an easy way to draw customers in for other items you might eventually sell from your homestead. Just like chickens seem to be the gateway animal, eggs can be the gateway product. 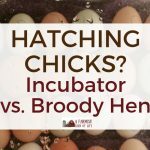 There is a big difference between selling a couple dozen chicken eggs from your coop to your friends, and selling several dozen a week at local farmers’ markets. Be aware of the rules about selling eggs where you live and do business. In order to successfully sell chicken eggs, you need customers. The best set up is having lots of customers with little competition—which can be hard to come by in the country where everyone and their neighbor has extra eggs to sell. If you live in an area where people will pay $6 a dozen, or you’re willing to drive to those people—and you don’t have 13 other small farms trying to sell to those same customers—then you’ve got an advantage to this whole egg thing. But many people I’ve come across have a rough time finding enough regular, reliable customers to do more than cover the cost of their own eggs, let alone make extra money doing it. When deciding to sell chicken eggs from your farm, there are some numbers you need to consider. How many chickens do you have, how many eggs do they lay a week, and how much does it cost to feed those chickens? Next, how many eggs do you need to sell per week to a) break even b) cover the cost of your own eggs, or c) make a profit? Now, what do you think about those numbers? Are you considering selling more eggs? Does that require getting more hens? How much will it cost to feed more hens? If your hens free range, they will cost less to feed. But free range hens don’t always lay their eggs in the coop, which means egg hunts—and potentially less eggs found. When our chickens were free ranged and we sold eggs, if we found a random nest out in the woods or in the hayloft, we’d keep those eggs for ourselves, but not sell them to customers. I had no way of knowing how old those eggs were, and without candling them, I wouldn’t know if someone had been sitting on them at one point. It’s one thing if I break open a bad egg or half developed chick. But if my customers do, that’s no good at all. What do you do when chickens flat out stop laying consistently? Do you get more chickens or do you cut your amount of customers? What do you do when you buy more chickens and suddenly have more eggs than customers? How much do you need to charge per dozen to make your egg business worth running? And, more importantly, will customers in your area pay those prices? Do you have rooster? Because I don’t want fertilized eggs. Can you just pick the non-fertilized ones? I only want fertilized eggs. They’re more nutritious. I want my eggs washed. I don’t want my eggs washed. If I see a blood spot, does that mean it’s the beginning of a baby chick? What do you feed your chickens? Wait. You’re feeding them…that? Did you know I can get eggs cheaper right now at the store/down the road/from my niece? What do you mean you don’t have any eggs? What did you do to your chickens that they aren’t laying as much? Your chickens are free range? How do you control what they eat? Your chickens aren’t free range? Why not? Another issue in dealing with customers can be the ground rules regarding how people will actually get the eggs. Will they pick up their eggs at your farm? If so, are there certain hours reserved for pick up? Here is a little tidbit I can share with you, looking back on when we used to sell chicken eggs from our farm. It was an adventure, to be sure, and it came with quite a few lessons learned. A certain number of chickens will generally lay a certain number of eggs. Which is wonderful, because it helped us figure out how many customers we could reliably provide for while still having enough eggs for our own family. But then, as time went on, word got out that we had chicken eggs. And now more people wanted to buy from us. Which is great! So we got more chickens. And they laid more eggs. We had eggs coming out of our ears. It was amazing. But then customer #3 decided to get her own chickens and customer #7 decided she only wanted eggs once a month. Customer #12 wanted three dozen a week but only on Tuesday and only if we could drop them off for her. Customer #13 didn’t need eggs all summer because she would be at the lake. Customer #15 decided she only wanted duck eggs—had we ever thought of raising ducks? And suddenly we found ourselves with many many extra dozen eggs to sell, but with half the customers that we had before we added all the extra birds. We found ourselves with two choices: get more customers, or have fewer birds. We looked for more customers, but didn’t have any luck at the time. We made the decision to cut our flock in half. We sold birds in order to cut down on egg production. Now we had less birds and were getting a sensible amount of eggs a week, which was a perfectly lovely number for our family and a few regular customers. And wouldn’t you know it—a month or so later, customers came out of the woodwork. Suddenly everyone. wanted. eggs. Not even kidding. Weigh the pros and cons when deciding whether to sell chicken eggs from your farm. When deciding whether or not to sell eggs from your farm, there are many things to consider. Weigh the pros and cons to make the best decision for your homestead. With the right frame work and customer base, selling some of your eggs can be a way to cover some costs associated with keeping chickens. And who knows, if you’re lucky enough, you might even make enough money to buy a few more feathered friends! Love your podcast Amy! And I appreciate your concise and honest presentation! Coming back for more! Say Goodbye to the Jones’s The last thing you will need to know before launching your homestead is to adjust your attitude. When you decide to homestead your priorities have to change. We never had a problem selling all of our eggs. We started out with two ladies at church as regular customers. One day the lady that does the soundboard asked me if I had eggs in those Walmart bags. I said yes and the rest is history. It turns out she has a big group of people in her Co-op and she would buy as much as we could give her. I now have two other ladies that have lots of eggs to sell. They bring them to me, my co-op lady picks them up and I pay the other two when they drop off the next weeks eggs. It’s perfect for me, I don’t have to drive, they all come to my house on a set day. It can’t be any easier than that. I mike a small profit doing that also. Oh, and when she has orders for non-refrigerated eggs I just use my eggs. We can’t really free range in the desert where we are due to hawks, works and coyotes so we built a huge aviary for them. I sprout mung beans and give them other things. However in the spring we turn them loose when we are outside so they can eat bugs for awhile. It worked out great for us. Good suggestions all around, Amy. Markets do indeed come and go, and egg availability does indeed vacillate. Plus the more birds you have, the more management is required. And what do you do with your old birds when they are no longer profitable layers? Which is probably after two years. Although delicious for certain recipes, old laying hens are hardly comparable to broilers. And how many stewing birds can you reasonably fill your freezer with? It’s doubtful that you will be able to sell them. Plus you have to start a replacement flock every so often if you want continuous production. Which would mean having a duplicate set of facilities if your operation is any size. It’s one thing to start a small flock of replacement chicks in a separate section of the coop, but quite another to start 50 or 100. I’ve never had any luck with true free-ranging, there are just too many predators around, and aerial attacks from hawks are a real problem, and the more birds you have, the more they’ll attract. My UPS dude used to buy 17 dozen per week, and asked that I get more hens because he wanted more eggs. There were no grown hens available in my area at that time, so I explained that I could only get chicks, and they would have to mature. He agreed. THREE weeks later, he asked me when he would get more eggs, and I patiently RE explained that chicks have to mature and gave him a target date. He agreed to wait. The biddies started laying and I showed him a tiny first egg, explaining that they lay 2-3 of this size and that soon, he would have all of the eggs he could want. The next time he came, he told me that his neighbor was getting chicks and he would get eggs from him!!! I RE explained that he would be waiting since they also had to mature and the guy didn’t even have them yet! His reply: “Not as long as I already have had to wait.” I gave up at that point, since the legal system frowns on strangling your UPS guy. I have sold many thousands of eggs in my lifetime, but that the most memorable customer ever. BTW- when I found myself with too many eggs, I made a LOT of egg custards. That really uses them up on the odd weeks when there are no shows. I got my customers to meet me at the local Walmart- that way, I didn’t have a a bunch of folks at my farm, and I didn’t have to chase anybody down and waste gas. They either showed up, or they didn’t. Mostly, they did. Love your articles Amy! Yeah, chickens are the gateway critter drug for sure!